For now, the Microtext Department room at the Boston Public Library retains its quaint, last-century ambience. Located on the first floor of the McKim Building, fronting Copley Square, the narrowly rectangular space features a 74-foot-long arched ceiling overlooking a row of microfilm machines and work stations. In a few weeks, however, the machines will be gone, a nearby reference desk removed, and the room on track for a $1.8 million makeover. Next fall, if all goes as planned, the space will reopen as the new repository and exhibit hall for the library’s Norman B. Leventhal Map Collection, one of the country’s foremost cartographic resources. Many of the collection’s most valuable maps, atlases, and other materials will come out of storage and into fuller public view. For the first time, library officials say, visitors will have ready access to an asset most Bostonians know little about. Meanwhile, the Leventhal collection will bolster its mission to serve as an educational resource for teachers and students as well as historians, scholars, and collectors. Library officials will meet with project architects and designers next month to finalize plans for the new gallery. Details being considered include a large digital globe with touch-screen features; a “pop-up’’ table orienting newcomers to Boston’s rich history and unique geography; large-screen digital displays of maps and other materials; specialized display cases for the collection’s most prized assets; and a map club for kids. The BPL owns the country’s second-largest collection of such maps, most of it 19th century vintage. The collection is ranked among the 10 finest in the United States for its size and historic significance. The Leventhal Map Center grew out of a $10 million endowment gift in 2004 from Norman Leventhal, the Boston developer who began collecting vintage maps in his late 60s. Now 93, Leventhal has amassed more than 400 specimens, many documenting Boston’s changing profile over the past three centuries. Over the decades, the library built its own collection through private donors and acquisitions by its staff, currently budgeting $100,000 annually for new purchases. 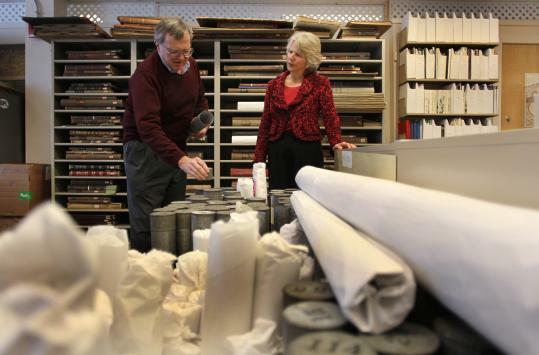 Once Leventhal elected to partner with the BPL, library officials say, discussions began about creating an exhibit space for the entire cartographic archives, most of which is housed on the third floor of the Johnson Building annex. Several sites within the library were considered before settling on the first-floor space in McKim. The project was expedited earlier this year, said Leventhal Center executive director Janet Spitz, with the primary criteria being easy access by the public, space to accommodate researchers, and room for families to feel comfortable to explore with their children. “Map lovers are made, not born’’ is one of the center’s guiding philosophies, Spitz said. The gallery is scheduled to open in October, with a private preview ceremony timed to coincide with Leventhal’s 94th birthday in August. Even as plans for the new gallery take shape, the center is continuing to conserve, scan, catalogue, and digitize its archival assets. To date, more than 3,100 maps have been posted on the center’s website, maps.bpl.org. They are also available to download, along with more than 90 lesson plans designed for K-12 educators. One hundred maps went online in October, and the number of maps available online is expected to nearly double over the next two years, aided by a 2010 grant from the National Endowment for the Humanities. Website visitors now number 1.1 million annually, according to Spitz, and they spend an average of 40 minutes per visit. “There are a lot of map lovers out there, and they’re discovering us,’’ she said. In May, to further showcase its collection, the Leventhal Center will mount a 3,500-square-foot exhibition titled “Torn in Two,’’ commemorating the 150th anniversary of the Civil War. The exhibit will use maps, paintings, photographs, diaries, and other period materials to explore the war’s causes and consequences, with a focus on Boston’s role in the conflict. Visitors will be able to adopt a Civil War-era persona to help organize their stroll through the exhibit. After 2011, it will tour other venues around the country.